From the fiery, 3-star Michelin chef on Fox's new hit, Hell's Kitchen. 100 fantastic recipes for fish and shellfish, from one of London's best-known chefs. 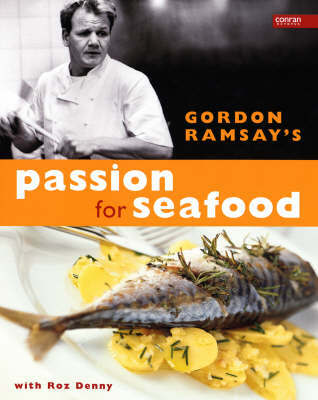 Includes complete instructions on filleting, skinning, trimming, preparing, flavoring, marinating, cooking, and freezing all kinds of seafood. Each recipe includes instructions for substituting alternative fish, as well as tips for the perfect wine. Includes sections on Stocks and Sauces, Soups, Starters, Salads, Risottos and Pastas, homestyle Fish, Dinner Party Fish, Barbecues and Casual Occasions, and Side Dishes. Recipes include Salmon Fishcakes with Brioche Crumbs, Crab Ravioli with Lemongrass Vinaigrette, Fennel Soup with Roasted Cod, Roasted Bream with Citrus and Basil Sauce. Recipe measures are given using the Metric system; there is a conversion table on page 219.